Product Sample: A complimentary travel pet bag was provided to me in exchange for being included in this post. All opinions are my own, of course! The only problem? That’s expensive. And we have a dog to worry about. Luckily, we have a fantastic support system of dog lovers (my mom is Rigby’s #1 pick for pet sitter) but sometimes even she isn’t available. I came to this realization a few days ago that we were both invited to a wedding out of state, requiring me to figure out new travel plans for the little man. Because Rigby is Shiba through and through, I can’t just drop him off and hope for the best. He requires a lot of planning, and one of the things I always plan at least a day in advance, if not more, is what to pack for him. I’ve come up with an extensive list that I thought I’d share just in case you have any vacations coming up where your pup will be enjoying a “vacation” of his/her own too. 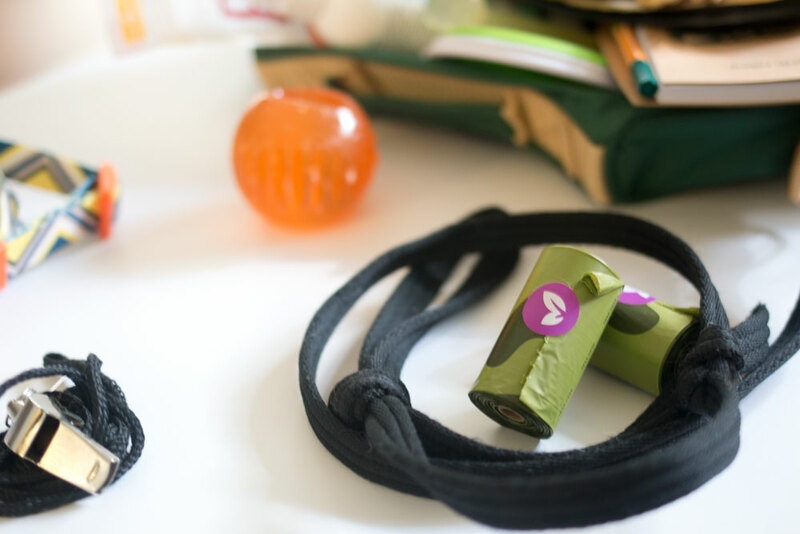 Poop Bags: Gross, but true. Dogs have waste just like we do, and I always send him with scented poop bags (the ones pictured are lavender scented from Earth Rated!) so that the picker upper is less grossed out by the duty. Favorite Toys: I can’t take Rigby’s entire toy box, but I always am sure to pack him a variety of toys (balls, chews, tugs) to keep him entertained. 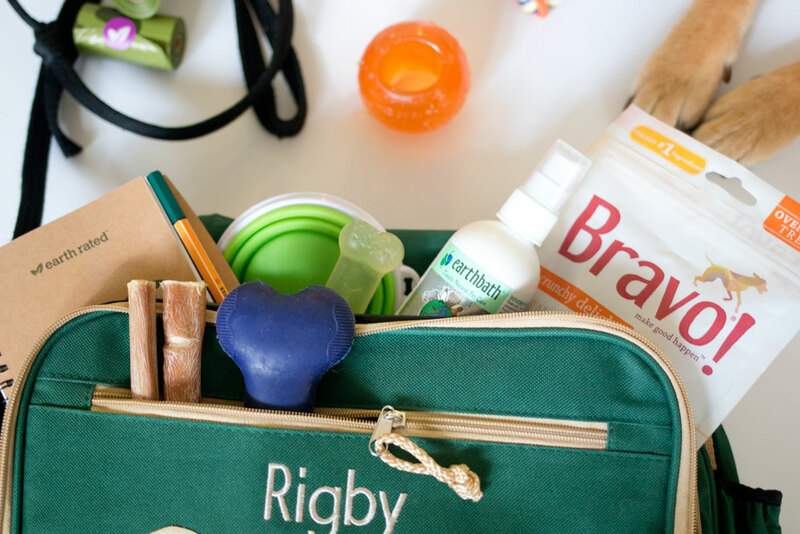 Favorite Treats & Chews: Just like his favorite toys, Rigby requires many treats and chews to keep him busy and out of trouble. I usually pack a brand new bag of treats and a few bully sticks. Whistle: Rigby was whistle recall trained as a puppy and he without fail, to me anyway, will come back when he hears it. This is something we ensure his sitter has and knows about. Hot Spot Relief or other first aid product: Rigby is an obsessive licker if he gets injured, so I always try to pack a first aid item (liquid bandage, hot spot relief) in case of a minor scrape or spot. Food & Travel Bowl: If you’re not sure of the pet feeding situation at your pet’s destination, a packable travel bowl can come in handy. I always try to pack the simplest food for someone else to prepare, which is one of the major reasons I love Bravo’s freeze dried raw. Medications or Supplements: We don’t have any of these, but if your dog is currently on medication or supplements be sure to pack those with instructions! Bed, Crate, or Blanket: If your dog has a safe bed, crate, or blanket that they always sleep with, be sure to pack this. A crate may not be the most convenient thing to pack ever, but if it’s your dog’s safe zone, it’s important that they have it where they’re staying too. 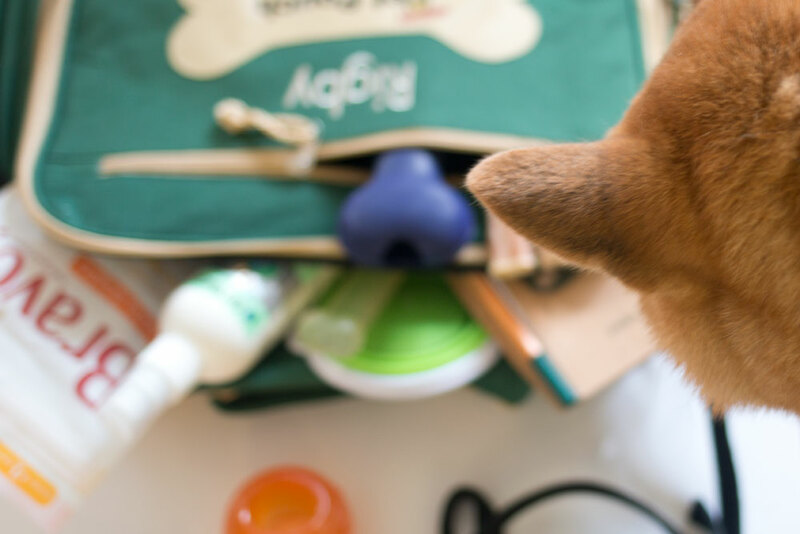 What do you pack for your dog when you’re away? Where is your next travel destination, or your dream destination? I’d love to hear about it! I have a Shiba and have to be careful as well. I’m fortunate that his trainer does boarding, so he stays there. He gets lots of people love and doesn’t have to have dog love which he is not a big fan of. That is very fortunate, it’s always nice when our dogs can stay with people they already know well! You’re such a good doggy mom. I am pretty similar to you except I have a pretyped letter with all the numbers and instructors for Starla that I always give to my sitter. I really need to train starla to recall with a whistle! She’s good with always coming back but even last night she dashed out the front door across the street to chase a bunny and I need to have something that would make her come back immediately. Aw thanks Alanna! Recall training with a whistle is pretty simple, it’s just a matter of working on it a lot. Really Reliable Recall is a great video on how to train it – we found it at our local library! Love this! 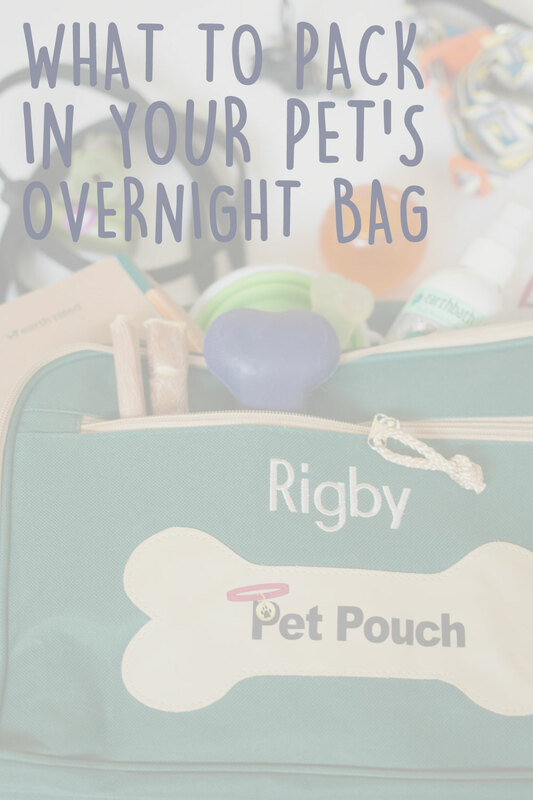 We have friends who dog sit for us and we always pack a doggy overnight bag too! Love that yours is personalized with his name, too cute! Thanks Julia! I’m loving it too! I love that you’re a well planned, throurough dog mom like me! I would totally did this for Warner, complete with a list of medications, list of contacts and approved foods and a description of his disease so his sitter knew exactly how to take care of him. I will do the same for Gatsby when we have to leave him with sitters eventually. Love that too, Ashten! Gatsby is lucky to have you! I always plan what to pack for Lily like a week in advance!! I hate leaving her even if it is with a friend or family member. I want to make sure she has everything she might need. P.S. I love that bag too! How handy! Thanks Hilary! We hate to leave Rigby too, but knowing he’s wth my mom always makes me feel a bit better! We also have a fold up wire one which I love for that reason, and I know Rigby likes having that as an option wherever he goes too! This is so adorable! I’ll have to look at getting one for my dog! Thanks Christine, I thought so too! Haha, I used a recyclable shopping bag previously! I like the sturdier bag but whatever works as long as it gets there, right? That’s such a cute bag! My parents are our number fur-baby sitter when we travel too, and having everything in a bag is a must. I didn’t think of having the vet’s number written down, but that’s a great idea! They’re just like kids, you never know what could happen! Exactly! I hope they never have to use it, but you never know! These are great tips! And what a cute little overnight bag! I’ve really gotten it down to packing for Rosie since we’ve moved with her three times this summer! She has a travel bag with her treats, toys, vaccination records, heartworm meds, water bowl, poop bags, the works! Thanks Chelsie! Sounds like you’re super prepared too! This sounds just like me packing Sheba’s things! There’s so much to remember, but fortunately, my parents are the ones to usually watch my pup so they know the drill! Love the personalized bag! Isn’t it great that our parents will watch our dogs?! It’s really such a relief! Thanks Rachel!